You think your water cutbacks are tough? Try farming without irrigation, relying only on rainwater. Actually, lots of crops are dry-farmed across the state. Wheat and grapes are common, and there are tomatoes on the Central Coast, squash in Humboldt and potatoes in Marin. 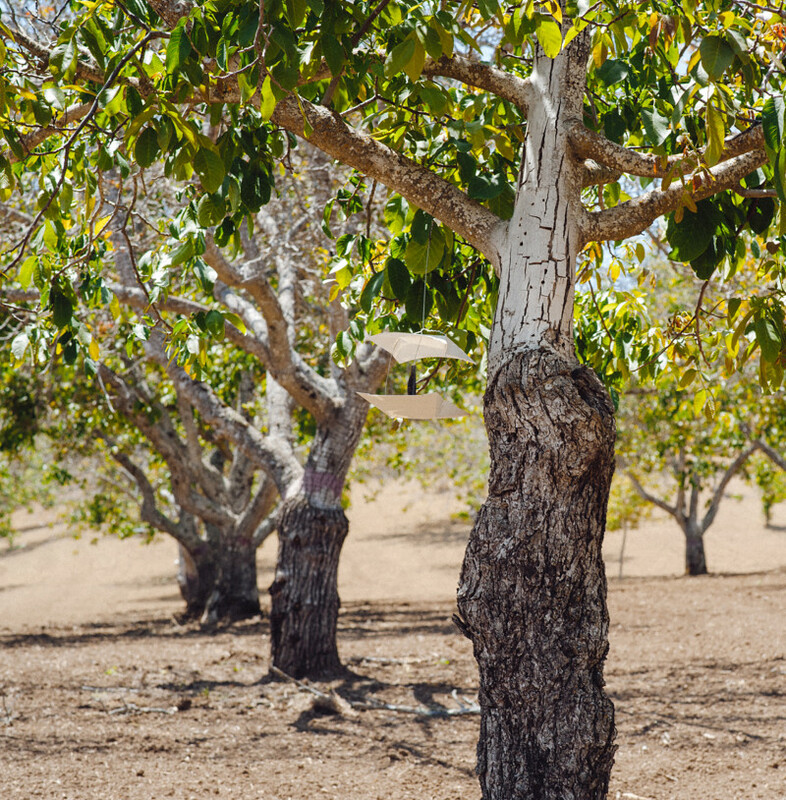 Jutta Thoerner dry-farms walnuts outside Paso Robles in San Luis Obispo County, and she’s an outspoken advocate of the practice. 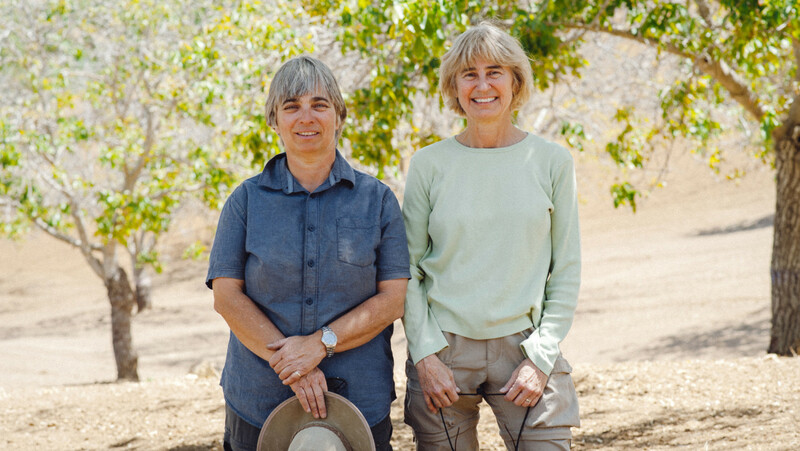 Thoerner and her partner, Cynthia Douglas, own Manzanita Manor Organics. They have solar panels running their coolers and sheep grazing their vineyards. 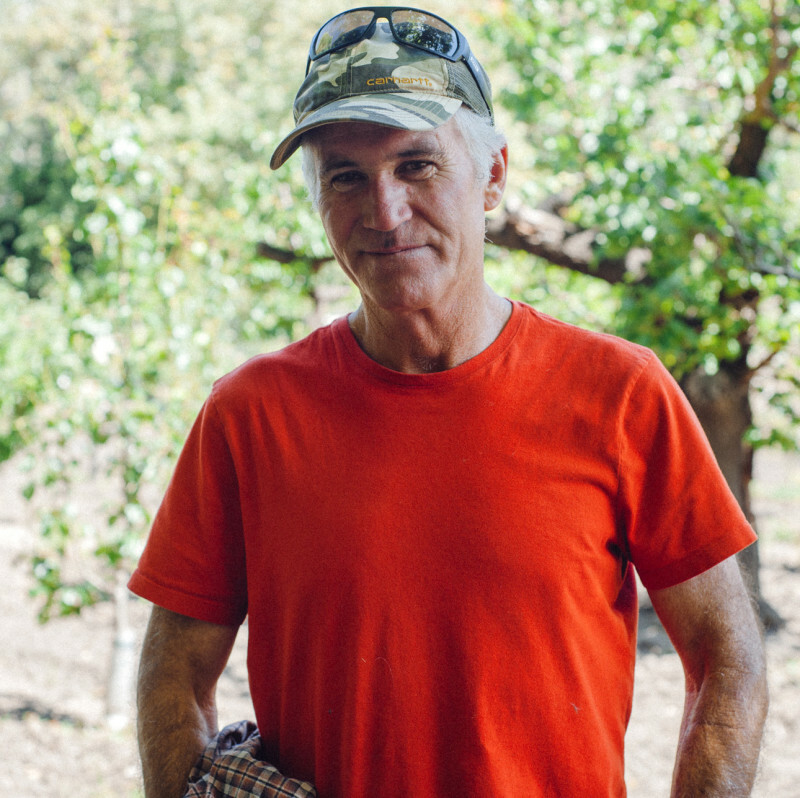 At their walnut orchard, Thoerner gets a tractor out only twice a year. Mostly, she uses horses. Today, Thoerner sits in a wagon, gently but firmly directing two horses named Sonny and Lily. They’re pulling a large log behind the wagon to smooth out the ground. This process will help keep moisture underground, and make harvesting easier. As she unhooks the horses, she explains that it’s all part of her process of dry farming, using no irrigation ever, on her trees. People have farmed this way for hundreds, if not thousands, of years. That was before irrigation came in and people planted crops more densely on all types of soil. Thoerner says dry farming’s a good fit for coastal or foggy areas, less so for huge operations in sandy soil. Dry farming’s not about crossing your fingers and hoping for rain. Thoerner keeps her trees spaced far apart so they don’t compete for water. She monitors the weather carefully, trying to estimate the ideal time to cultivates the soil. Then she creates a dust mulch, a kind of seal, like she was doing with her horses and that log. While workers trim trees by hand, Thoerner explains that she has to graft two kinds of walnuts together to get the best results. 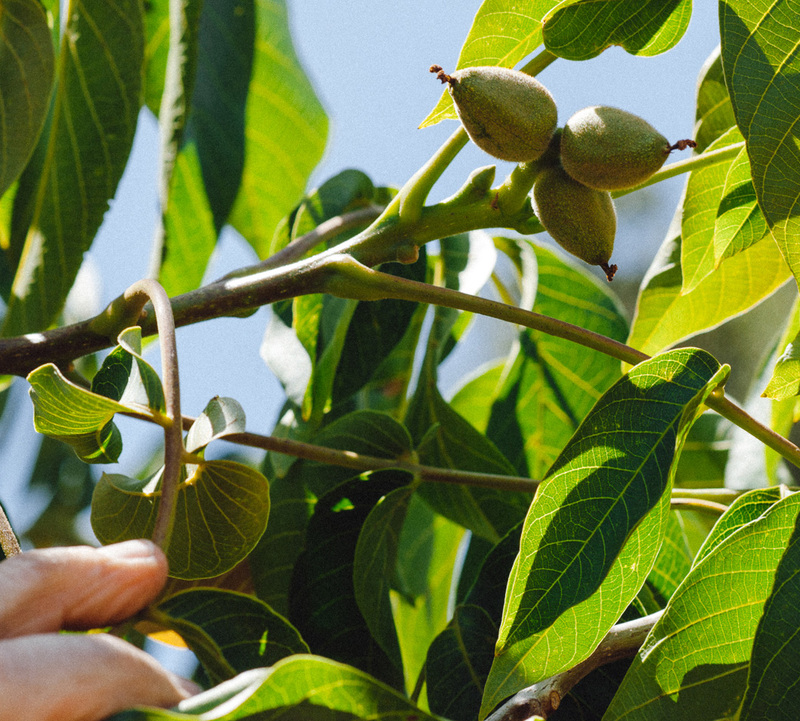 The variety on the top -- which grows a great-tasting walnut -- is grafted onto a different, heartier stock, whose roots are great at finding water underground. These last few dry years, Thoerner and workers protect grafted branches by wrapping them in cages of chicken wire covered in shade cloth. “It looked ridiculous but it worked,” she says. But the drought definitely makes dry farming harder. Thoerner and I stand underneath a tree where she looks for examples of doubles, sets of two walnuts in clusters, which can mean a better yield. Despite that find, I can see the orchard is suffering. Some trees have dead branches, and the walnuts, which are always smaller than ones from irrigated orchards, are really tiny this year. Many are just a little bigger than my thumb. These small nuts taste sweet and buttery. 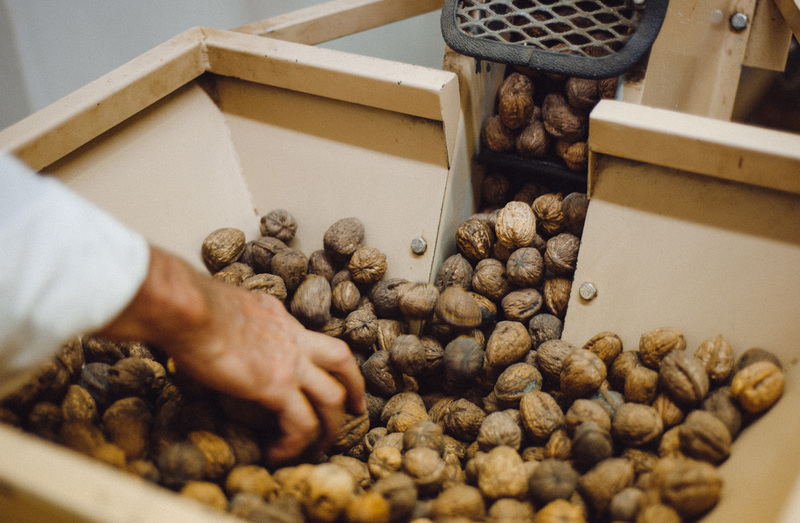 But lately, Thoerner says, tree breeders have focused most on developing varieties that produce big walnuts that crack easily, and fall out in perfect halves. That’s a silly standard, she says, when people are just going to chop them up into salads and cookies anyway. “Whatever happened to taste, people?” she asks, incredulously. About 40 miles west, farmer Mike Cirone says his farmers market customers are becoming connoisseurs of his small, sweet, dry-farmed fruit, clamoring over his dry-farmed apricots. Same goes for the 60 varieties of apples he farms without irrigation. 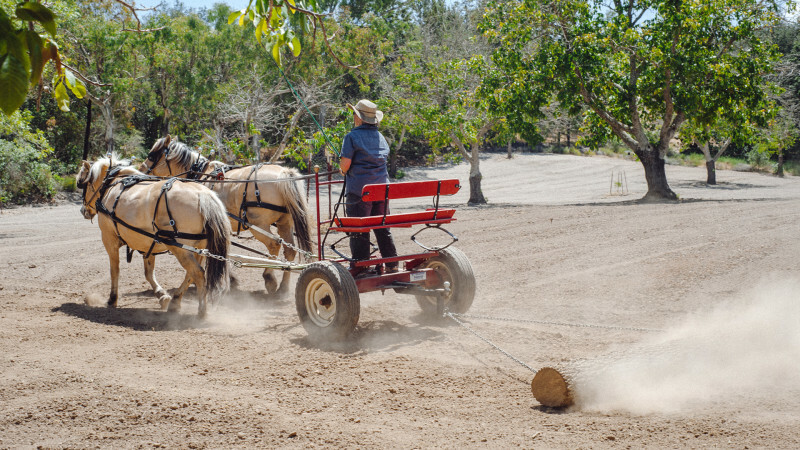 Cirone’s been successfully dry-farming for over 30 years. Digging his boot heel into dry topsoil and revealing moisture underneath, Cirone explains that he made it through a drought in the ‘80s pretty well. Jutta Thoerner is concerned, too. “If the drought continues and the global warming continues, I don’t want people to stop farming,” she says. She concedes that the profits aren’t as big in dry farming, but she hopes some small growers will consider converting their irrigated orchards, or planting new ones for dry farming, rather than giving up. She’s most hopeful that young farmers will hear this message. Her advice? Just find a piece of land with good soil and do it. This piece is part of the series California Foodways. Stories in the series that address food and climate change are funded by a grant from Invoking the Pause. Lisa Morehouse produced this story while at a residency at the Mesa Refuge.